The lawsuit from December 2016 claimed Apple was responsible for failing to implement safety features that would lock out and prevent FaceTime from being used while driving. By not including technologies that appeared in patent filings to stop calls from being used on FaceTime, Apple was accused of acting "with a willful and knowing disregard of the rights and safety of another." The case was dismissed in May, the BBC reports, but the Modisettes family continued the fight to the appeals court, which agreed with the earlier decision. The court concluded Apple "did not owe the Modisettes a duty of case," as they "cannot establish that Apple's design of the iPhone constituted a proximate cause of the injuries they suffered." The suit stemmed from a death caused by a December 24 accident in Texas. When James Modisette slowed the vehicle his family was driving in due to road congestion, a 20-year-old driver drove into the back of the family's car at 65 miles per hour, causing injury to the passengers and leading to the death of five-year-old Moriah Modisette at a local hospital. At the time, the rear driver told police he was on his iPhone 6 Plus on FaceTime during the crash, with investigators later discovering the app was still in a call when police arrived on the scene. Apple had received a patent in 2014 for a "Driver handheld computing device lock-out," a system that would automatically shut off distracting phone functions if it detected the user was driving. The patent's existence and non-implementation was also raised in an attempted class action lawsuit in California in January 2017, which claimed Apple didn't put the idea into practice over concerns it would lose market share. 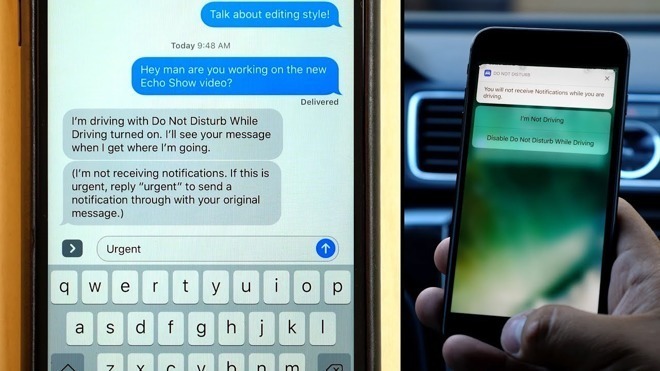 The "Do Not Disturb While Driving" feature, which arrived in iOS 11, effectively performs a lock-out for calls and messages if the user is driving, similar to the patent's descriptions. The feature can be set to operate when connected to a car's USB port or Bluetooth, or to kick in when certain types of motion are detected, though passengers are able to override the setting. A study from April suggests the introduction of Do Not Disturb While Driving has helped reduce the number of accidents on US roads, with phone usage while driving decreasing by around 8 percent and with it being activated on 80 percent of iPhones in the month after its iOS 11's release.